In previous posts, I developed a node.js application that could provide temperature updates to clients using socket.io. 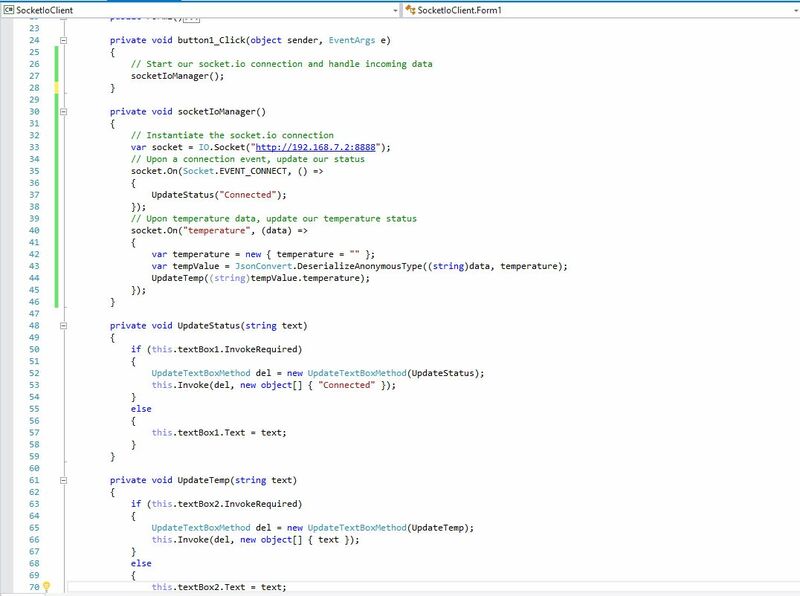 With renewed interest in .NET, I thought it would be interesting to see if I couldn’t build a Windows Form app client that could connect to socket.io interface and receive the temperature updates. While targeting a Universal Windows project has perhaps more contemporary relevance, for this example, we’ll stick to the classic Windows Form application. 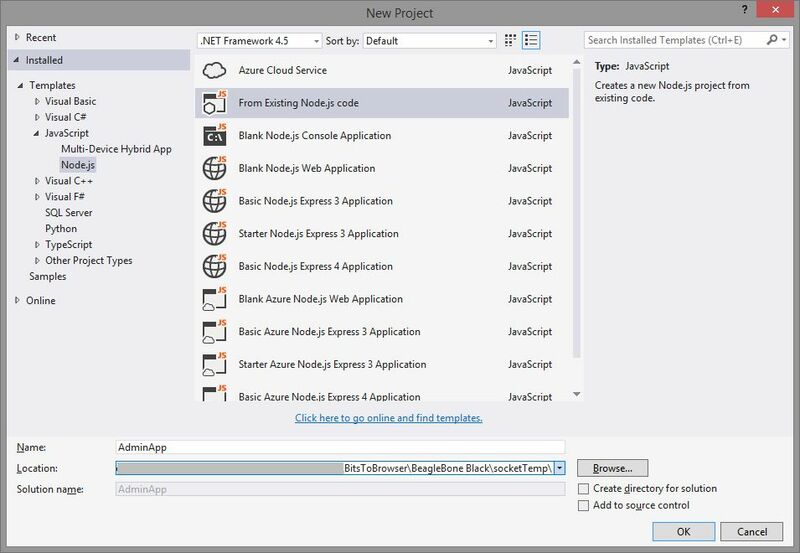 You’ll want to start a new Windows Forms Application, as selected from Visual C# – Windows – Classic Desktop template section. After we’ve started a new project, we’ll need to add two nuget extensions: SocketIoClientDotNet and Json.NET by NewtonSoft. SocketIoClientDotNet provides a .NET-based socket.io implementation, in this case the client-side interface – a server-side interface is also available. 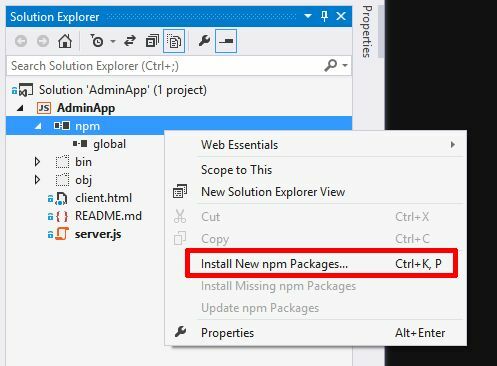 Use nuget to search out and install the library. We also need to also nuget Json.NET, which will provide us tools to handle incoming socket.io data delivered in JSON format. To summarize our current location: We’re on the path of building an administration website built using the AngularJS framework, hosted on the BeagleBone Black (BBB). The purpose of the administration site is to allow us to adjust key configuration parameters and launch other applications. Essentially, I want to provide a web interface to the BBB, similar to the one provided for a network router. Having written a prototype node.js app which provides us near real-time data via the sockets.io module, we are ready to begin building out the application to do more. Because we’re going to do a lot more, we need to better define our development environment. In this post, I’ll document the development environment I’m using to build out the administration web application then in subsequent posts I’ll delve into discussions on our AngularJS MV* infrastructure and tying Angular to core BBB functions. So let’s start. 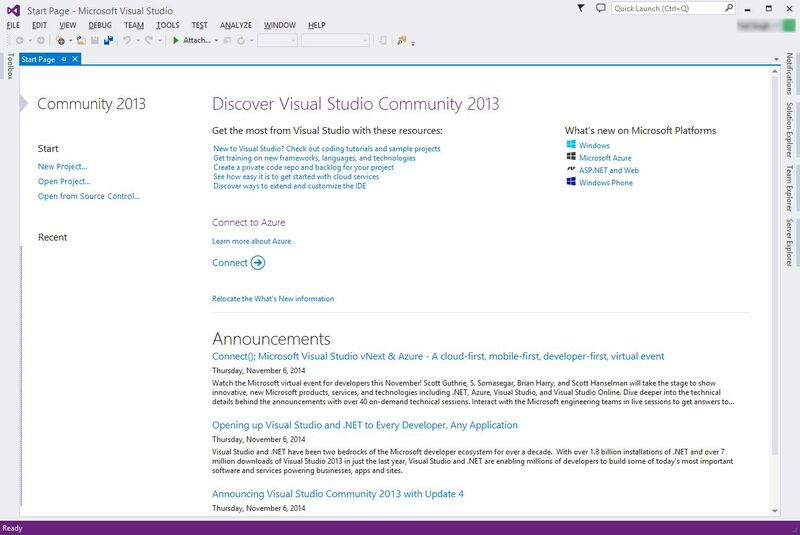 If you don’t have VS2013 already, head to the the Visual Studio website and download it. It’s not a small piece of software, so allow 15-30 minutes to download and install. Before we jump in, I’m also going to add in the Web Essentials 2013 for Visual Studio plugin to give us even more developer friendly tools. Information on Web Essentials is available here, but the download is kept here. Once everything is installed, we’re ready to fire up Visual Studio. To start, we’ll create a project, but reference our existing work, then we’ll import the relevant files to get to a point where we are ready to work. Visual Studio will ask us to build the project. 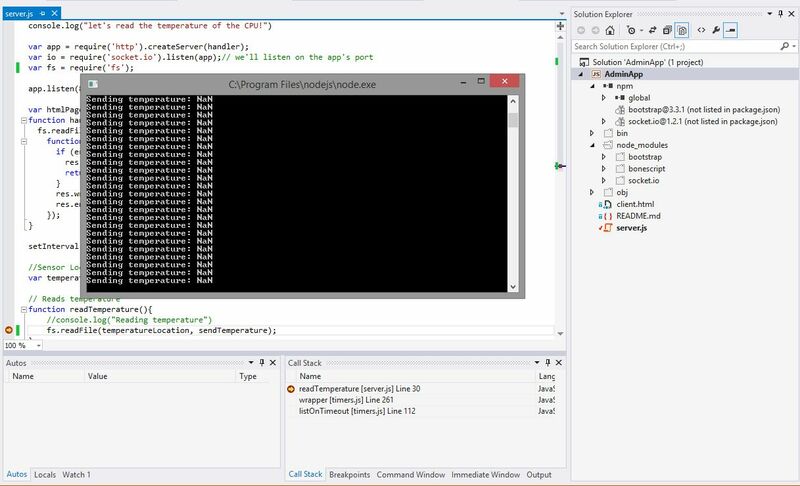 VS2013 is not really compiling, but it needs to build a framework for it to support our debugging efforts. 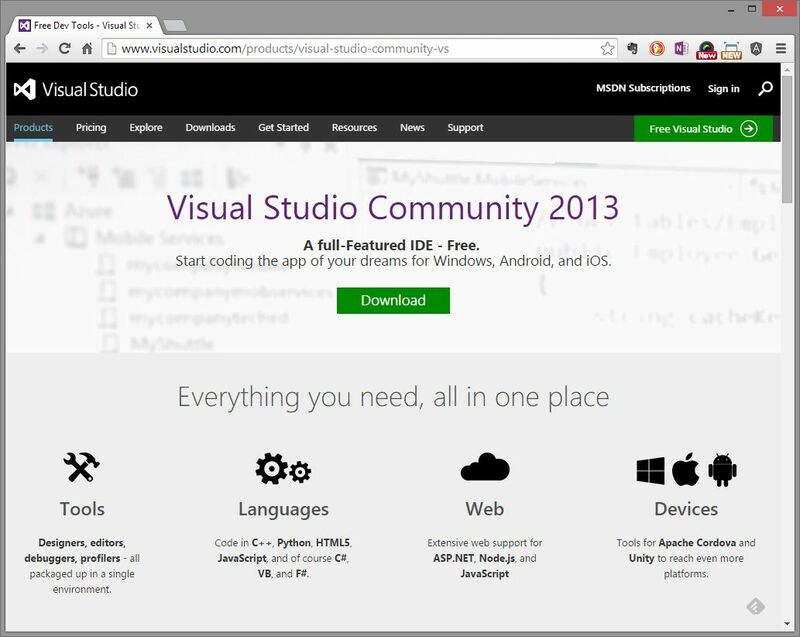 This is pretty easy to get around, we just tell VS2013 OK, do what you need to do. 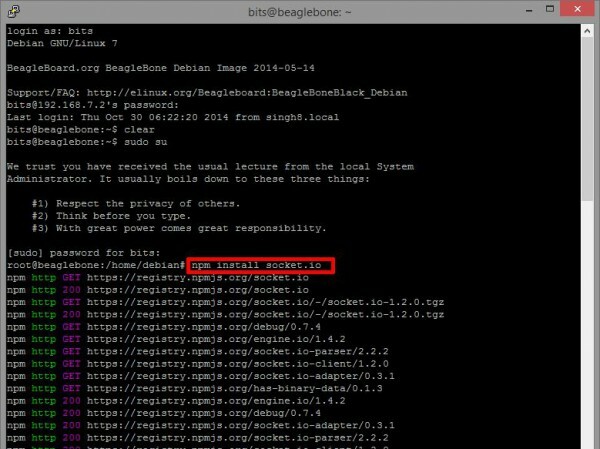 Our application will fail in the command line, because we’re missing our referenced libraries. To fix this, we need to import the modules into our project. 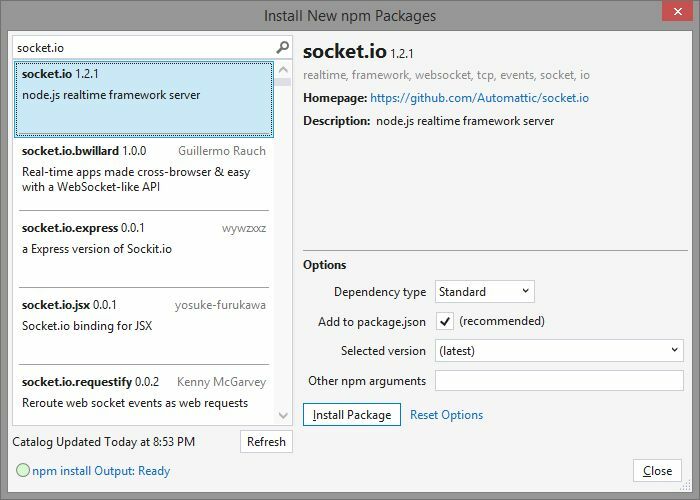 We can install socket.io by selecting npm (Node Package Manager) from the Solution Explorer window, right-clicking and selecting the “Install New npm Packages …” option. 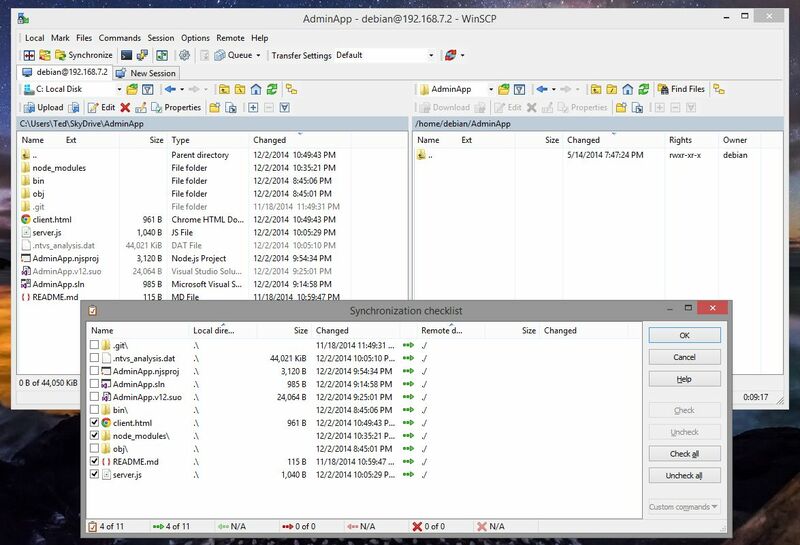 The first time you do this, it will download all of the available module options (there are a ton), but subsequent times, it will be near instantaneous to get to the window we want. As per our first few lines of the app.js file, we can see the list of modules we need to include. 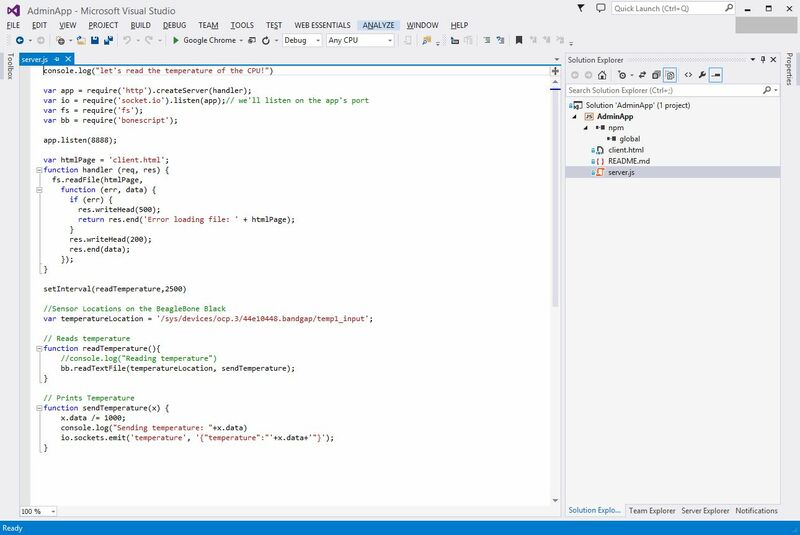 Simply search for the relevant modules and add them, Visual Studio will add them to the project and, optionally, to the package.json file. Make sure that you include the right modules, because there are so many of the same name – if you make a mistake, simply remove them from the Solution Explorer tree. We will also modify our code to use the fs module, instead of the bonescript module, to have a more generic code base. With this complete, we’re ready to test our project. We can select the Debug menu’s “Start debugging” option, press green arrow button on the menu bar or simply press the F5 function key to launch the application. Of course, we won’t see a temperature, because we’re running the application on a PC for the moment, but it will prove that our application is functioning and ready for debugging. We can even use breakpoints and the watch windows if need be. 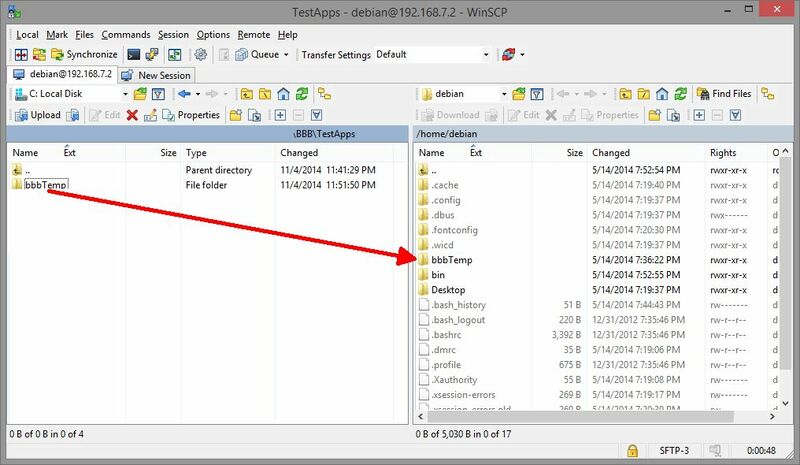 Use WinSCP – upload the files to BBB directly. This may be faster and more direct. Furthermore, it is possible to set up a directory synchronization task to manage host and target directories automatically. First, I’ve created a github repository which contains the source for our project. It can be found here: https://github.com/bitstobrowser/socketTemp. To run the code, you can download it either directly to your BeagleBone Black or to your desktop and use a utility, like WinSCP, to transfer it to your BBB. 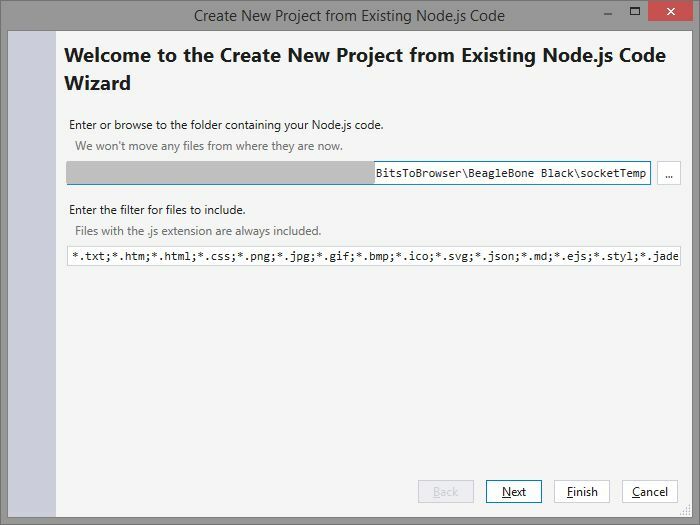 Once on your BBB, navigate to the directory and start the server by executing the following command: node server.js. Lines 3-6: Define the set of libraries that we need to use. Importantly, we tell socket.io to listen for any connections on the server’s port. Line 8: Here we listen for any HTTP requests on port 8888. Line 23: Sets a timer to go off every 2500ms or 2.5 seconds. We’ll use this to read and update the attached browsers. Lines 28-32: This is the function that is called every 2500ms and it reads the contents of the temperature file and then calls another function to send the information out to any clients. Lines 34-39: This puts the temperature in a JSON object and then emits (sends) the data to all attached socket connections. Line 6: Creates a socket connection, using the same port as the specified in the browser access. Line 7: Defines what we do in case we get a socket message of type ‘temperature’ – we will call the handleTemperature function. 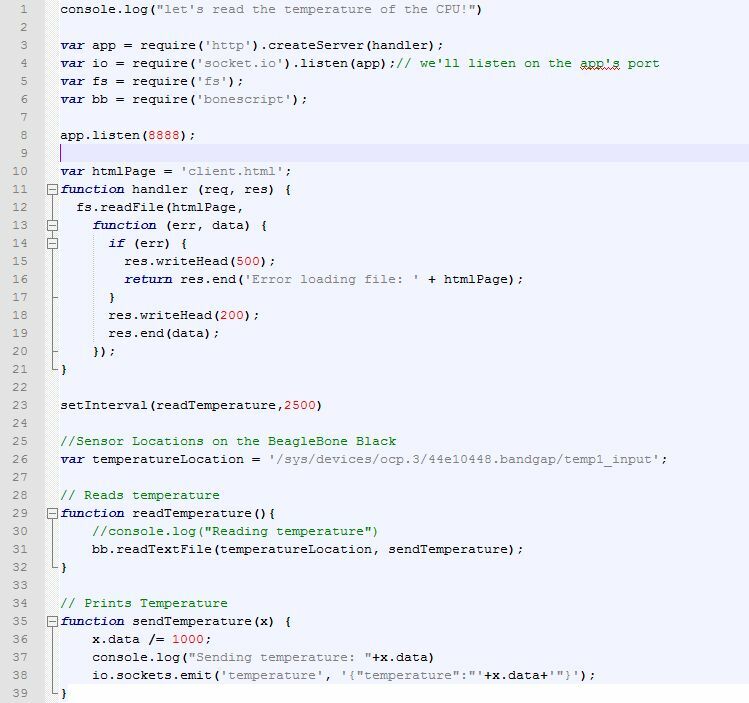 Lines 9-14: When we receive a ‘temperature’ function, we unpack the JSON object to get the value sent to us. We convert to Fahrenheit for our display. 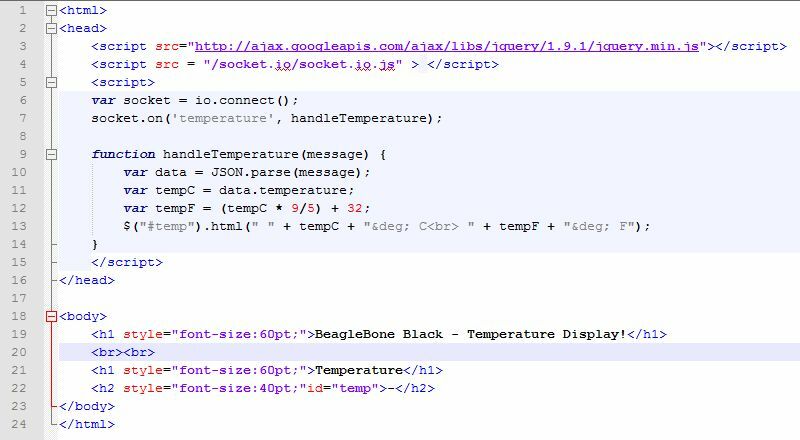 Then finally on line 13, we update the HTML as marked by the “temp” ID with the latest temperature information. Lines 18-22: This is our basic HTML display – line 22 will be adjusted whenever we receive a message by the handleTemperature function. What we’ll do in this step is to read the on-board CPU temperature of the ARM 3359 processor, every second and inform any attached browser of the most recent value. In an obscure forum discussion, I was able to find out my Debian BBB-specific distro makes this CPU temperature register location available at the /sys/devices/ocp.3/44e10448.bandgap/temp1_input – you may need to verify that this is available on your OS or if there is a slight variation of the location. Information on the bandgap register is available in the AM335x Technical Reference Manual (chapter 9). The temp_input file holds the current temperature (multiplied by 1000) – for example, in the image below, the CPU temperature is 53 C. On the web, you’ll see many caveats that this not an accurate measurement and should not be used for any serious application – but for our demo app, it serves the purpose of sending I/O changes from the BBB to any attached browser. Our node.js server does two things, first it serves up a web page, when requested, and secondly, every second it sends the latest temperature to all of the attached browsers. 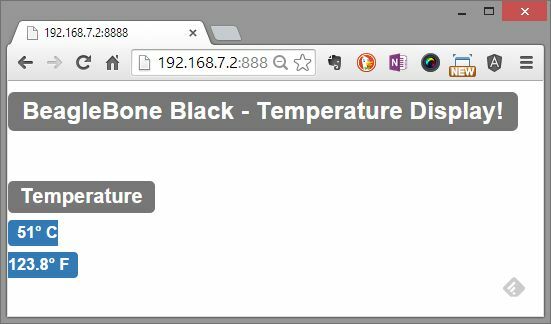 Our first step to getting this working is to install socket.io using the node package manager (npm), which handles the transporting of temperature information to the browser. I noticed that I was having problems doing any work, node started behaving weird and I started getting errors. I realized that the partition allocated for the Linux kernel on my SD card was full. While I had an 8GB SD lying around, I was able to stumble on this excellent set of instructions to expand the Linux kernel partition on my SD card, which allows me to continue to use my 4GB SD card, with a 10 minute procedure. 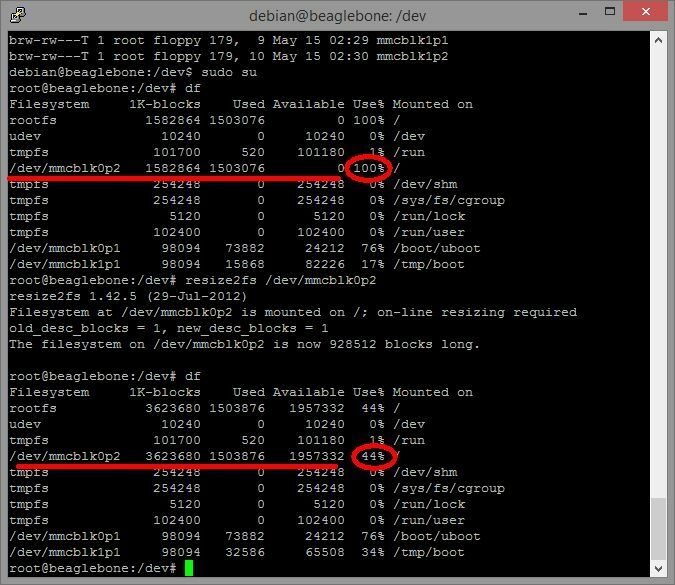 What I learned from this detour is that a 2GB SD card shouldn’t be used for Debian on BBB, the 4GB is fine, but consider right-sizing the partitions beforehand and, if available, start with a 8GB SD. 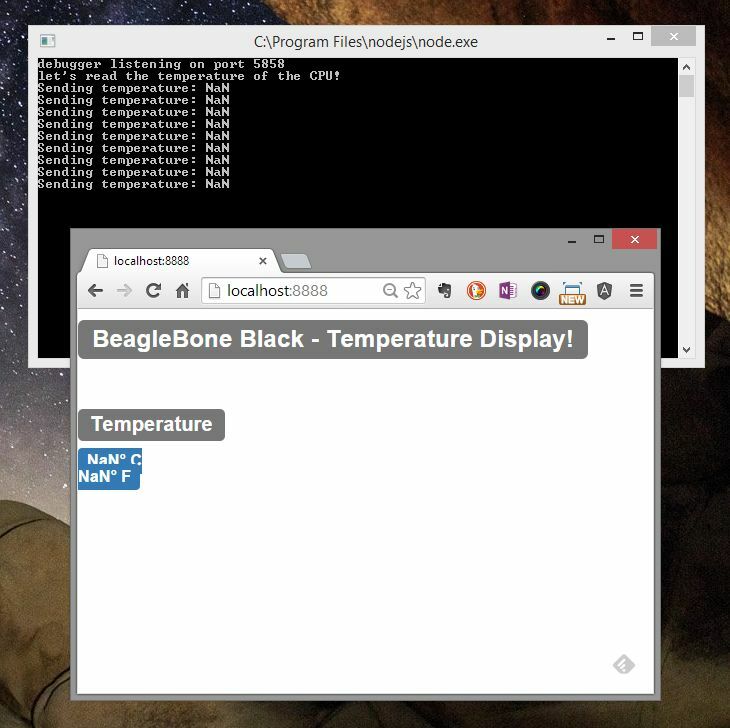 So back from our tangent, we’re ready to test out reading the on-board temperature measurement and displaying it in (near) real-time to a connected browser. I’ve written a very small node.js app called bbbTemp which performs this function.